I took a look at SFC Energy because it was one of the bigger German net-net's based on market cap. The company was also trading at approx 50% of book value so I figured it was worth a look. The company is interesting, they have developed a fuel cell technology which they manufacture in Germany and sell across Europe. The fuel cells are marketed to many different segments such as military, industrial and recreational. One market they seem to highlight is the RV market, they tout fuel cells as a reliable and portable way to take energy with you. I'm not sure I'd want to be lugging a fuel cell with me on vacation, but maybe that's just me. The fuel cells can power up to 250 watts and there's a very cool worksheet showing the energy savings by switching small power needs to a fuel cell technology. What's great is SFC has a nice English version of their website here. They also have English copies of their annual reports and news releases. This appears to be a byproduct of the fact that they sell product in the UK. For such a small German company to publish in English is very rare in my experience. I have my net-net worksheet below. 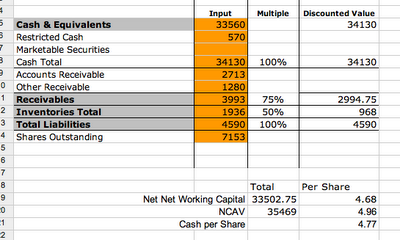 The shares are trading a little bit above NCAV but not much. When I first ran my screen a few weeks ago they were below, but the shares are volatile. The company isn't currently profitable and has a net retained deficit. It appears the company is hoping to grow revenue quick enough to outgrow this problem, this is risky at best. There are many companies in the green space hoping to strike it big, I'm not sure what would set SFC apart. The balance sheet is really the only bright spot for SFC, they have most of their current assets in cash with little receivables and little inventory. The concern is that the company has a very high cash burn rate currently. In 2010 they had -€4.7m CFO, -€2.3m CFI and negligible CFF for a total burn rate of €7m a year. At this rate their cash hoard could last up to five years, but even so a discount should be applied to the cash to reflect the high burn. SFC Energy seems to be trading at an appropriate value in light of their circumstances. The company is in a startup stage and is well capitalized if they can find success in the next few years, but this is a big risk. For this stock there isn't enough of a margin of safety for me to invest. For someone who wants a way to get in on the ground floor of the green movement in Europe SFC Energy might be that vehicle, but that's not how I invest. I look for a safety of capital, that doesn't exist in this case, it's very likely SFC Energy could never reach escape velocity with their revenue and burn through their cash hoard. Just a quick side note, some readers might wonder why I post 'junk' companies such as this. I treat this blog as my journal, and since I spent some time looking into it I want to record my thoughts for the future. This means I won't only be posting the best ideas I find in the markets, instead I'll be posting most ideas I decide are worth more than an initial 10 minute review. Even if it turns out to be a bad investment I believe there are things to be learned, it's the process that matters, and practice improves the process. As always I'm open to comments or opinions to the contrary. Disclosure: I do not hold a position in any issues mentioned in this article. I'm very happy for you to post reviews on junk companies. I am a beginning investor and your posts are giving me a good idea on how to approach my analysis.